With a total of 807 lots and plenty of realistic estimates the sale at Sheppards online and in Durrow today offers something for new and established collectors. The Winter Show in New York, a world leading antiques fair, highlighted cool contemporary alongside antique pieces as being the way forward in interior style and Sheppards have latched on to this with their sale entitled Decor Decoded. The codes on offer here include design decor, decorative art, fine art, sculpture, rugs, silver and jewellery. A garniture of three Chinese cloisonne enamel vases (200-300) would not be remotely out of place in a contemporary setting. 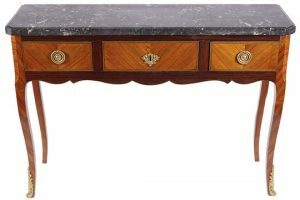 Lot 639 is an 18th century French transitional side table c1760 with veined grey marble top. It is estimated at 800-1,200. 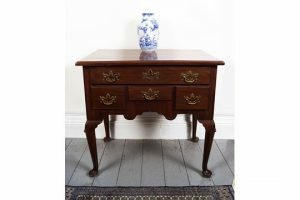 There is much to catch they eye, from Edwardian and Regency mirrors to breakfront bookcases, art and Chinese ceramics. 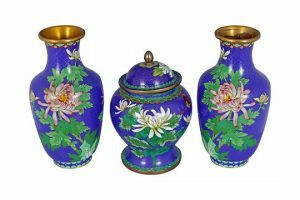 There are large Chinese blue and white jardinieres, botanical prints, an Art Deco mantle clock, wall light brackets, vases, brass table lamps, a Tibetan bronze bust, lustres, figurines, toureens, bookcases, a Venetian pier mirror, a Georgian workbox and even a set of 15 antique apothecary jars. If that does not set fire to your imagination then it is difficult to say what will. This entry was posted on Tuesday, January 29th, 2019 at 2:55 am	and is filed under ART, AUCTIONS, COLLECTIBLES, FURNITURE. You can follow any responses to this entry through the RSS 2.0 feed. You can leave a response, or trackback from your own site.